The Lone Ranger is a 2013 American western action film produced by Walt Disney Pictures and Jerry Bruckheimer Films and directed by Gore Verbinski. Based on the radio series of the same name, the film stars Johnny Depp as Tonto, the narrator of the events, and Armie Hammer as John Reid (The Lone Ranger). It relates Tonto's memories of the duo's earliest efforts to subdue the immoral actions of the corrupt and bring justice in the American Old West. William Fichtner, Barry Pepper, Ruth Wilson, James Badge Dale, Tom Wilkinson and Helena Bonham Carter also are featured in supporting roles. 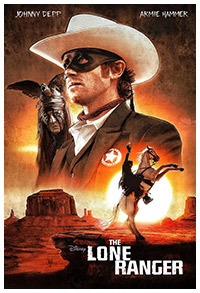 The film marks the first theatrical film featuring the Lone Ranger and Tonto characters in more than 32 years.